Ever wonder where the Waldorf salad gets its name (yes, these are my morning ponderings – I’m a geek)? I did, and after a little digging, I’ve uncovered that the Waldorf salad gets its name from the fact that it was “invented” in 1893 at the Waldorf hotel in New York City. In case you’re in the “unknow”, typically this salad is composed of chopped celery, nuts and mayonnaise, with variations including with fresh fruit, dried fruit and various fine herbs. 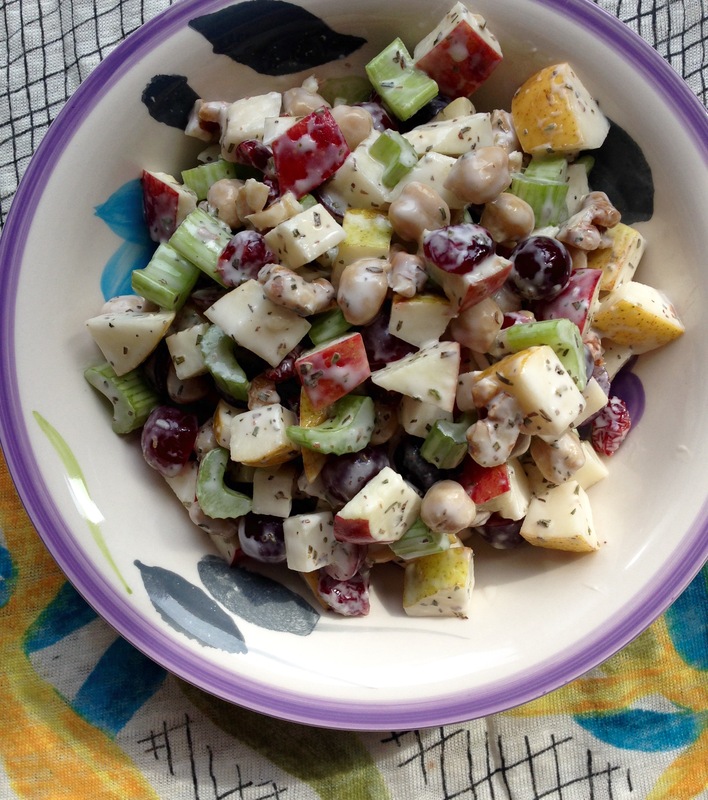 Usually, a Waldorf salad is more of a side dish than a meal, due to the absence of protein. 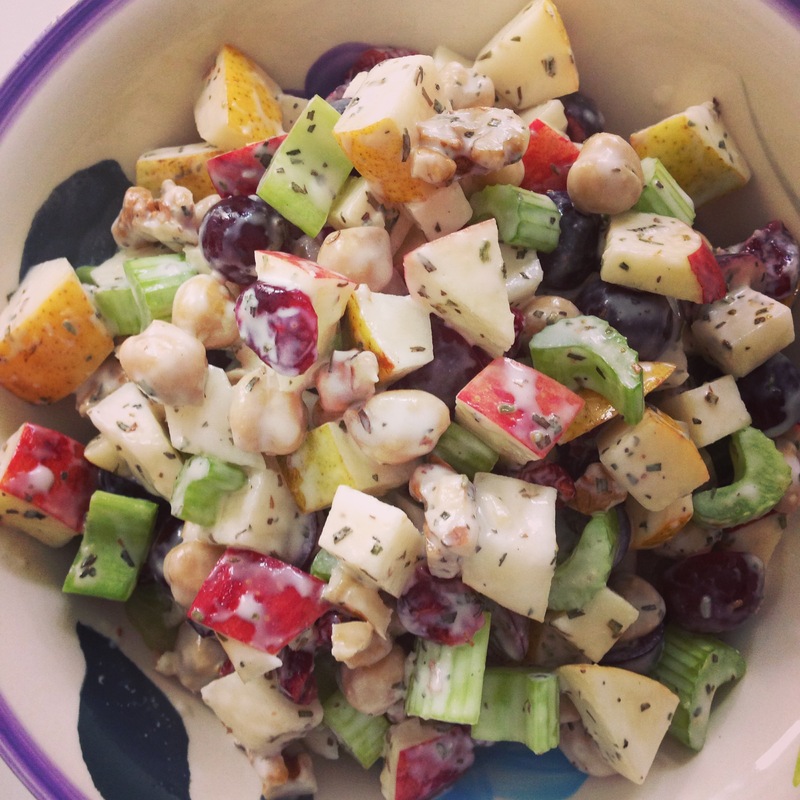 But today is your lucky day (maybe even go buy a lottery ticket – or not), this Waldorf salad contains chickpeas, which ups the protein factor and therefore its satiety factor and its “I can be a meal” factor. It is quick and easy to throw all the ingredients together. Light and easy to digest, yet filling. Chickpeas have a low glycemic index, which can help you control your weight. Red apples provide flavonols which help prevent cancer, as well as quercetin which can strengthen your immune system. Pears are one of the highest fiber fruits, providing 6 grams per medium-sized fruit (this helps you work towards your daily goal of 25-35 grams of fiber), and also contain boron, which helps your body retain calcium. Walnuts can help make your blood vessels more elastic and contain antioxidants, even though people’s minds commonly jump to fruits and vegetables when asked to think of antioxidant sources. Dried cranberries contain proanthocyanins which prevent bacteria like E.Coli from adhering to the walls of your urinary tract. You must be itching to make the recipe now, so here it is! Serve on a bed of finely chopped romaine (optional). This is my new favourite lunch. Hopefully it will become one of yours too! Here’s to hoping!